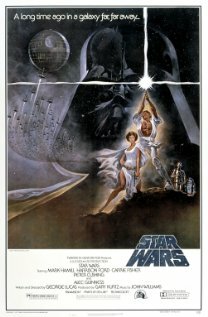 Well, more like 1977, but whatever, we were introduced to Luke Skywalker (Mark Hamill), Princess Leia (Carrie Fisher) and the American Film Institute’s #3 All-Time Movie Villain, Darth Vader (James Earl Jones) just to name a few. Thirty five years later and it is still making new fans of this sci-fi/fantasy classic. I will say the special effects in Star Wars are pretty impressive for the 1970s, since we are pretty spoiled these days with amazing CGI and special effects in movies. From all of the droids, unique creatures and trying to save the galaxy, the main point of the plot really breaks down to good vs evil. Obi Wan and Luke (an aspiring Jedi Knight) utilize the Force for good and noble purposes to defeat evil while Darth Vader uses the “dark side” of the Force to manipulate, oppress and even kill. Princess Leia isn’t your stereotypical princess, she has gumption and is a strong female character, not often do we see this in movies of this time period. And there is the likeable rogue Han Solo, slickly played by Harrison Ford, he plays an integral role in saving the others and the galaxy from the evil clutches of the Empire. George Lucas was ahead of his time with the creativity used and if you haven’t seen this already give it a shot. And I cannot forget to mention that John Williams gave us one of the most recognizable musical scores to date. If you enjoy this check out the 2 sequels and 3 prequels in the series. Motherly Advice: It has been many years since I have watched this I was excited to see what ClearPlay would do with the movie because my little boy hounds me to watch it. My filters were set to “most filtering” which will spare you some burned bodies, pilots exploding in their star fighters during a battle and an arm being severed off. The violence that remains has lots of lasers (in lieu of guns) and light-sabers as in the duel with Darth Vader and Obi Wan Kenobi. Darth Vader is seen choking an Imperial Officer, ClearPlay does cut some of it but you still get the idea. Of course when you are dealing with other planets you will encounter different creatures, which may be a little scary looking to younger children. The mild language that was used was taken care of by ClearPlay. The characters visit an intergalactic bar where there is use of “otherworldly” drinks and smoking. I do appreciate the message of evil vs good but with the violence in the battles I would recommend age 8 and up which just may make my 4 year old very unhappy. Hannah – May the force be with you.